What to wear It's always nice to have two to three outfit options for your engagement session. (Undecided? Bring more and I can help you narrow it down!) The key thing is that you need to feel comfortable in what you're wearing. Clothes should fit you well and should be wrinkle and stain-free. Logos and text. Unless, of course, you want to do something off-beat and fun like a team jersey (Gators anyone?) for one of your options! Clothes that are too baggy or too tight. Dress for your body type! Clothes that fit you properly will be the most flattering in photos. Sleeveless clothing can sometimes be unflattering. If you've got a sleeveless options, perhaps bring a cute cardi or jacket to throw over it! Being all matchy-matchy. You don't normally dress like clones, why do it for your photos? Complementary colors are a good way to go. However if you're dressy, then your guy should be dressy. If you're casual, he should be casual. All white and black shirts with jeans. These are looks best left home. So you're probably wondering what's left?! Jeans are always a good choice. Flirty and fun dresses photograph well. Just be mindful of the length! Bright, solid colors photography well. If you absolutely must have a pattern, then your other half should be wearing something solid that complements it. Funky accessories! Bring a variety and we can play with options. What about locations and props? I can suggest pretty locations to you all day. But let's make it meaningful to you as a couple! Do you guys love riding bikes together? Let's shoot that! Coffee shop connoisseurs ? Why not shoot there? Did he proposed at Bok Tower? Why not shoot in the gardens? Bring your pet...fun props that showcase your hobbies together...you're only limited by your imagination. Stuck for ideas? Let's brainstorm. Call me and we'll come up with some creative options for personalizing your shoot. When you book your engagment session depends largely on how you hope to use the photos. 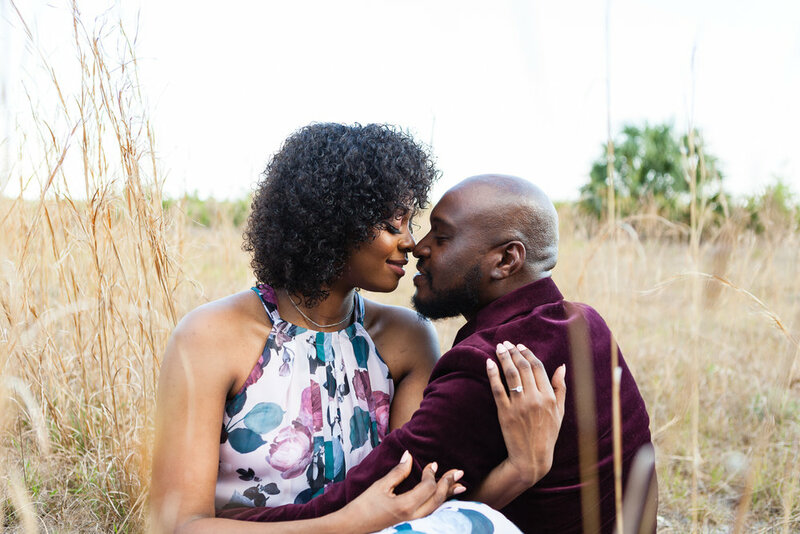 If you want to use them for save the dates, you'll want to book your session four to six weeks before you want to mail them to your guests to allow time for editing, designing, printing, and, oh yeah, envelope addressing! If you want to have a photo guest book at your wedding, I'd suggest doing your engagement photo shoot no later than two months prior to your wedding. Again, this will allow time for editing, designing, and printing. Got questions? Call me. Email me. Send snail mail. That's what I'm here for!